As a complimentary service to the tours, I can arrange for you any kind of transfer. I offer transfers from and to the airport, from and to the train station, the transfers around the city of Prague. I am also able to arrange for you a private transfer to or from the important European destinations such as Vienna, Salzburg, Passau, Budapest, Nurenberg and others. In these transfers, I guarantee professional, licensed drivers who speak well English and can assist you with your travel needs. 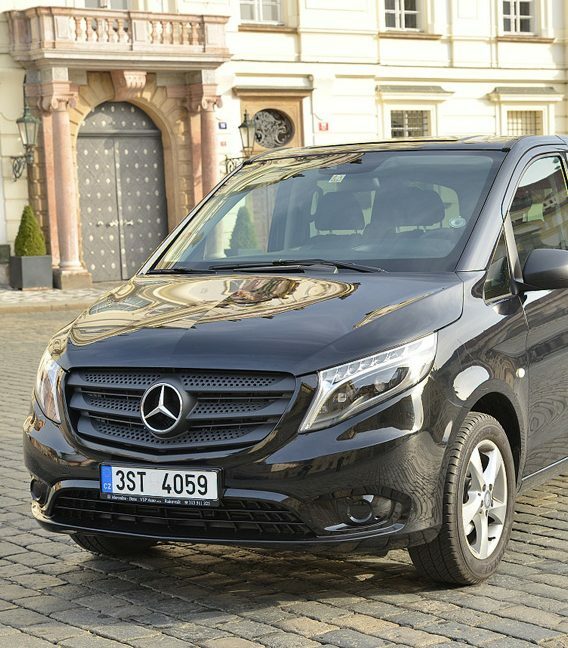 The transfers are realized in luxury Mercedes minivan VIANO. I also offer a higher standard of a luxury version as Mercedes V-class, if you require a high luxury car, please contact me by email to receive the price. I can arrange also a smaller or bigger size vehicles. The size of the vehicle can be up to 50 persons, to request the bigger size cars for more then 7 people, please contact me by email. The drivers always pick you up at the agreed place, assist you with the luggage and in case of a sightseeing transfer they give you the basic information about the chosen destination. I offer two options. A direct transfer or a transfer with a sightseeing on the way. In case of the transfers with sightseeing on the way, the driver can help you with the basic orientation in the chosen destination. A lot of my drivers are very knowledgeable but please note they are not licensed guides and cannot give you the same amount of information as a licensed guide. In the price of the transfers are included: pick up at the chosen destination, bottles of water, transfer in the luxury Mercedes car, the service of the driver, his basic explanations, assistance with luggage, with choice of the restaurants if needed, information on opening times of the sights and other requested basic information. The guiding service, entrance fees and meals are not included in the transfers. The professional driver will pick you up at the airport in the arriving hall holding a label with your name and takes you to the hotel or any other agreed place. In case of the return transfer, the driver picks you up at the hotel or any other agreed place and takes you to the airport. The professional driver will pick you up at the airport in the arriving hall holding a label with your name and takes you to the hotel or any other agreed place. In case of the return transfer, the driver picks you up at the hotel or any other agreed place and takes you to the airport. The difference between a regular transfer and this one is that this transfer guarantees a driver who speaks well English. Most of the drivers who I work with speak at least the basic but in the high season it cannot be guaranteed. If you want to make sure, you can reserve this transfer. The driver also gives you basic info about Prague and the Czech Republic during the transfer. Duration: depends on the chosen destination, the duration below are approximate durations without breaks. This transfer guarantees an English speaking driver with basic knowledge of the destination. He will assist you during the whole transfer, helps you with the luggage. You can take advantage of a pleasant person accompanying you during your travel and of a safe drive with a professional driver. These transfers are direct transfers and do not include any sightseeing on the way. The price includes: transfer in a comfortable Mercedes minivan, service of the English speaking driver, bottle of water, pick up and drop off at the chosen destination, my assistance on the phone if needed, breaks for coffee and restroom. The price does not include: entrance fees, meals, stop for sightseeing, guiding service. The transfers with sightseeing on the way provide a safe transfer from one to another destination with an option of a sightseeing on the way. Usually, it is a 3 hour stop in a chosen destination where you will have time to discover the area. The driver will accompany you during the whole drive and at the sightseeing stop he will give you some basic info, shows you good restaurants and gives you basic orientation in the area. Most of the time you will spend at the stop on your own shopping or sightseeing. Please note that the drivers are not licenced guides and they cannot give you the same amount of information as a tour guide. This transfer is mainly organized to make your travel more pleasant and take advantage of the long drives to hit some interesting sights on the route. I offer the transfers to and from different locations, please see below. I include here just the basic destinations but there are more options, to consult other options please contact me by email. The price does not include: entrance fees, meals, guiding service.